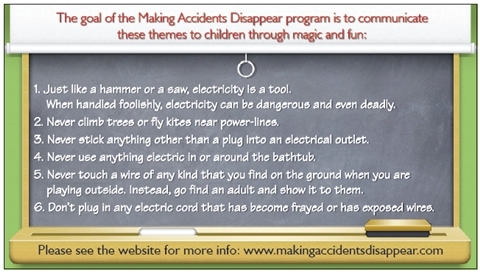 Making Accidents Disappear is an educational and entertaining program that teaches children the importance of electrical safety. 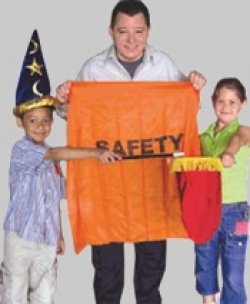 The 40-minute school assembly program uses audience participation, comedy, stories, and magic to communicate the importance of behaving safely around electricity. Because accidents, not diseases, are the number one killer of children in America, Making Accidents Disappear is a powerful tool that helps parents, teachers, and industry combat these otherwise needless tragedies. Unlike so many other causes of childhood death, accident-related death is the one that is most preventable with proper education. And, using fun magic tricks and illusions to seize the children’s attention proves the most effective method for insuring that this important message sinks in. In addition to safety tips, magician Scott Davis also teaches students about energy efficiency and conservation. Please click here to email Norma Beaver at Ouachita Electric Cooperative or call 870-837-3614 to Schedule Making Accidents Disappear at your school! To view pdfs, download Adobe Reader.